ARMS physicians are knowledgeable and have extensive experience with high-acuity patients. Their comfort level with “sicker” patients is unprecedented. ARMS takes a proactive, quality driven, patient-oriented approach to care. ARMS’ exceptional availability for rounding and on-call coverage is a much-appreciated rarity in the post-hospital setting. 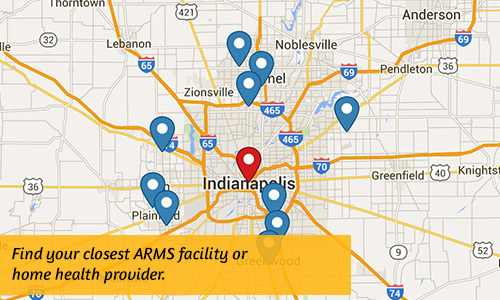 ARMS provides patients with medication reconciliation at both admission and discharge. Dependability of ARMS physicians and business staff provide peace of mind to partnering organizations that any questions or concerns will be resolved quickly. Excellent communication with clinical staff, patients and primary care physicians sets ARMS apart from many other providers. ARMS physicians and nurse practitioners take a leading role in improving care – they participate fully in partnering facilities’ quality programs, plus offer continuing education opportunities for their caregiving team members. ARMS support allows for unparalleled physician-to-physician collaboration and keeps care plans moving forward for the benefit of patients. ARMS providers offer a “How can we help YOU?” attitude that is a refreshing change in the post-hospital atmosphere. Patient cases are continually reviewed. Data is freely shared between ARMS and partnering facilities to monitor quality and look for potential opportunities for process and care improvements. We advocate for the involvement of specialty physicians and work a variety of them, including with neurology, plastic surgery and other wound care professionals, nephrology (kidney) geriatric psychiatry, and even physical medicine & rehab physicians. The availability of specialists varies by site. Have a question about a specific location? Send us a note. ARMS providers take a hands-on approach to care. They are on-site a few days per week (typically three) and support the care-giving team in partnering facilities by providing unsurpassed availability and guidance. Staff at partnering facilities have 24-hour direct access, seven days per week, to ARMS providers; ARMS does not use a call center – providers answer their own calls and text messages promptly. The ARMS model of care reduces 30-day readmission rates to 8-9%; the national average is 17.3%. Quality is the top priority at ARMS and the physicians and nurse practitioners work closely with partnering staff to ensure they develop the skills and confidence needed to provide the best possible care to patients. ARMS can offer the highest level of care outside of a hospital setting. The end result is an industry-changing approach to quality, rehab length of stay reduction and unprecedented decline in hospital readmissions. The ARMS model of care reduces 30-day readmission rates to 8-9%; the national average is 17.3%. The physicians at ARMS serve as actively engaged medical directors. ARMS not only provides compassionate care for patients, they also want to help partnering facilities and agencies succeed. From presenting staff in-services, to meeting with hospital discharge planners, ARMS providers and business staff offer all-encompassing support, and an overall higher level of participation, than other medical directors; ARMS partners can expect this ongoing high level of service throughout the partnership. To learn more about forming a partnership with ARMS, contact us.